The scholarship, tenable at any New Zealand University, is available to graduates registered for a PhD in physical sciences and engineering. In accordance with Professor Bates' love of interdisciplinary research a wide range of students in the physical sciences and engineering will be eligible. Preference will be given to those whose research aims to apply information/image processing to studies in medicine, the physical sciences, astronomy or engineering. Preference will be given to those whose research aims to apply information/image processing to studies in medicine, the physical sciences, astronomy or engineering. The study award, tenable at any New Zealand university for one year is available to students, who at the time of application, are engaged/enrolled in or applying for a Master’s degree which involves undertaking social sciences research. The Resource Management Law Association’s scholarship programme provides an annual funding pot of NZ$15,000 to encourage graduate students studying law, planning, engineering, geography, science, landscape architecture, urban planning and resource management, to focus their research theses or dissertations on topics related to the application of resource management in New Zealand. After election a successful candidate has still to apply to and be accepted by a Department or Faculty of the University and by a college. A Rhodes Scholarship is confirmed once a successful candidate has been offered a place in a Department or Faculty of the University and in a college. Tenure of other awards in conjunction with a Rhodes Scholarship is not permitted without prior consultation with the Secretary of the Trust in Oxford.The New Zealand constituency may elect up to three scholars each year. Te Pūtea Whakatupu Trust exists to support and accelerate Māori social and economic development by providing strategic leadership in education, skills, and workforce development. It has two strategic priorities: 1. higher levels of educational achievement amongst Māori; and 2. higher levels of workforce participation by Māori in key sectors of the economy. The second priority has a focus on lifting the level of Māori participation in middle and senior management capability in a range of industries, including fisheries. The Trust is concerned to ensure the potential of the Post Treaty Settlement Era is maximised by leveraging capacity and capability building to support greater Māori control and involvement in decision making in Māori industry futures. It is envisaged that the recipients of this scholarship will be committed to the future economic and social development of Māori, iwi, hapū and whānau. Two awards of $1000 each will be made, one for which only Māori women may apply, while the second is open to all women. Women's groups may also apply for either award. Students at Victoria University of Wellington or Massey University who are considering post-graduate study overseas are invited to apply for a Rotary Foundation Vocational scholarship. To offer people the opportunity to extend their education or training focusing on subjects that will benefit rural community, for example midwifery or agriculture/horticulture. Rural Women New Zealand wishes to offer people the opportunity to extend their education or training in order to improve their level of skills. To offer assistance to students from rural areas to obtain tertiary qualification. This is a one off grant available to tertiary students to assist with the purchase of resource materials, including software. The International PhD Scholarship (a grant-in-aid) aims to build human capability in Science and Technology by providing early career support for New Zealand’s brightest and most promising researchers. Successful applicants will be expected to have an excellent undergraduate academic record and the potential to excel in a research environment in order to undertake the PhD course at their chosen host research institution. It is expected that recipients will complete their PhD and contribute to positive outcomes for New Zealand. The PhD Scholarships at the University of Cambridge aim to build human capability in Science and Technology by providing early career support for New Zealand’s brightest and most promising researchers. Successful applicants will be expected to have an excellent undergraduate academic record and the potential to excel in a research environment in order to undertake the PhD course at the University of Cambridge. It is expected that recipients will complete their PhD and contribute to positive outcomes for New Zealand. 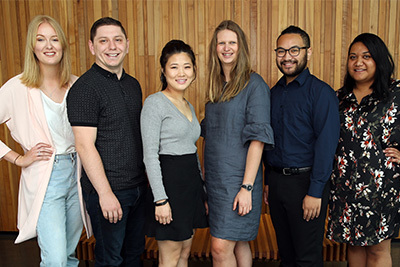 The Rutherford Foundation New Zealand Postdoctoral Fellowships aim to build human capability in science, technology, engineering and mathematics by providing early career support for New Zealand’s brightest and most promising researchers.